Show your team spirit with the Tennessee Titans Team Camo Dog Collar and Tag by Yellow Dog! 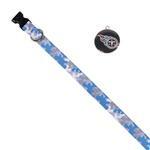 Now your pup can show support of your favorite team with the Tennessee Titans Team Camo Dog Collar and Tag by Yellow Dog. 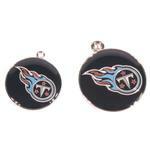 You'll love the camo print in team colors with a coordinating Tennessee Titans tag! This easy-clip designer collar is made in the U.S.A. of 100% vibrant color-fast polyester with durable plastic buckles, plastic slip locks, and a metal D-ring. Best of all it is washable! Look for the coordinating Yellow Dog team color leashes, sold separately. The products appear to be quite well designed.